Power Transformer Market size for 2016 was valued over USD 24 billion and the annual installation is set to exceed 20 thousand units by 2024. Escalating infrastructural spending supported by favourable norms pertaining to the refurbishment and expansion of existing grid networks will embellish the power transformer market size. Rapid urbanization along with ongoing industrial expansion across the developing economies will further boost the business growth. Increasing demand for the upgradation and replacement of aging electric network across the North America & Europe region will boost the product penetration. In 2016, the global infrastructure asset investments rose up to USD 413 billion, depicting a 14% growth when compared to the previous year. Higher mechanical strength, and low iron losses & flux leakage when compared to its counterparts will fuel the shell core power transformer market. Expansion across utility based grid networks coupled with rapid integration of clean energy will stimulate the product demand. Ongoing regulatory reforms pertaining to carbon emissions along with rising energy efficiency demand will further complement the business landscape. Auto power transformer market is set grow over 5% by 2024. Effective operational flexibility & voltage regulation will stimulate the product penetration. Compact unit structure, higher efficiency, and sustainable cost when compared to the traditional transformer technologies will encourage the product adoption. Rising space constraints along with increasing demand for the refurbishment of existing T&D infrastructure will positively influence the indoor power transformer market growth. Flourishing real estate sector across developing regions subject to exponential rise in public & private investments will further embellish the business landscape. In 2017, the European Commission allocated USD 36.3 billion fund to ascertain an effective infrastructural development across Russia. Oil immersed in 2016, accounted for over 60% of the global power transformer market share. Compatibility across high voltage applications coupled with effective cooling when compared to its dry counterparts makes its adoption preferable. The technology has witnessed sustainable penetration over the years subject to its optimum cooling strength. However, fire, health and leakage hazards associated with the units may restrain the product penetration. Solid insulation in the recent years has witnessed modest industry penetration subject to low consumer awareness & immense competitive influence from existing insulation technologies. However, the product is anticipated to witness sheer progression on account of its effective cost structure, insulating property, and compact configurations in the years to come. Consequent integration of digital monitoring technologies along with enhancing product flexibility will fuel the business growth. Rapid urbanization along with favourable government initiatives to ameliorate the contorting small-scale industries across developing regions will boost the single-phase power transformer market share. Integration of sustainable energy infrastructure favoured by regulatory initiatives including incentivization, and feed-in-tariffs to nourish their adoption across commercial & residential establishments will further augment the business outlook. 501 to 800 MVA power transformer market in 2016, was valued over USD 7 billion. Rampant industrial expansion subject to the adoption of volume manufacturing practices by large market participants across the globe will considerably thrust the industry potential. Ongoing expansion of utility aided high voltage grid infrastructure to cater the rising electricity demand across industries inclination will further reinforce the business outlook. Rapid expansion of utility aided transmission and distribution networks across rural areas will boost the demand for the pad mounted systems. Rising infrastructural investments towards the expansion of existing rail and road networks will positively influence the industry growth. Utility power transformers over the years have witnessed strong penetration subject to the broadly regulated electricity markets across the globe. Rapid expansion of grid networks in order to suffice the rising energy demand coupled with escalating investments toward the integration of clean technologies will boost the industry landscape. 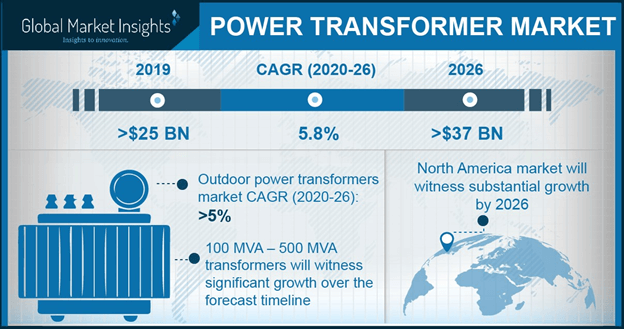 The U.S. power transformer market is set to exceed 15,000 units by 2024. Increasing demand for the refurbishment of existing grid infrastructure across the nation will stimulate the product penetration. Deployment of effective grid support units favoured by ongoing technological enhancements will further stimulate the product demand. Rising infrastructural funding towards the expansion of rail networks will further augment the business outlook. Rapid deployment of smart transformer technologies favoured by ongoing government initiatives to cater the rising energy efficiency demand will foster the Germany power transformer market share. Rising investments in line with large-scale renewable integration along with growing measures toward sustainable energy mix will complement the business growth. In addition, ongoing facility expansion by large automobile manufacturers will further boost the product demand. Mass manufacturing practices accompanied by rigorous R&D investments toward the development of effective and smart systems have been the key strategies adopted by the major market participants. Electrical power transformer is a static device used to transform electrical energy across the primary & secondary circuits based on the principle of mutual induction. The prime function includes transfer of power between circuits with minimum variation in the power frequency or the potential difference. The basic attribute of these units is to either step up the potential between two adjoining circuits or vice-versa.